When their friend Lucky is kidnapped by elephant poachers in Tanzania, the Global Rapid Reaction Responders team is called in to find him. 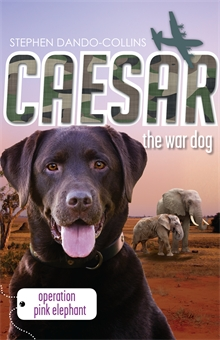 Caesar the super-sniffing war dog is among the team, along with his handler Ben and team leader Charlie, for the mission. After a death-defying parachute jump into the ocean and pickup by Australia's largest warship, HMAS Canberra, they start gathering clues. Saving Lucky and village children who have also been kidnapped by the heavily armed poachers is top priority, but the GRRR team is also prepared to do whatever is necessary to stop the cruel trade in elephant tusks. A battle is about to erupt on the African plain! As part of the research for this book, Stephen delved deep into the elephant tusk poaching trade, discovering that an Australian ranger was genuinely kidnapped by poachers. Stephen was also a guest of the Royal Australian Navy for a private tour of HMAS Canberra.